I love Mexican food of any sort and make it often. Fish tacos, pork carnitas, honey lime chicken enchiladas............the list goes on. Most are easy to make once you've prepped the fresh ingredients. If you leave the heat element to the salsa - each person can decide for themselves how spicy to make it whether mild or screaming fire engine. 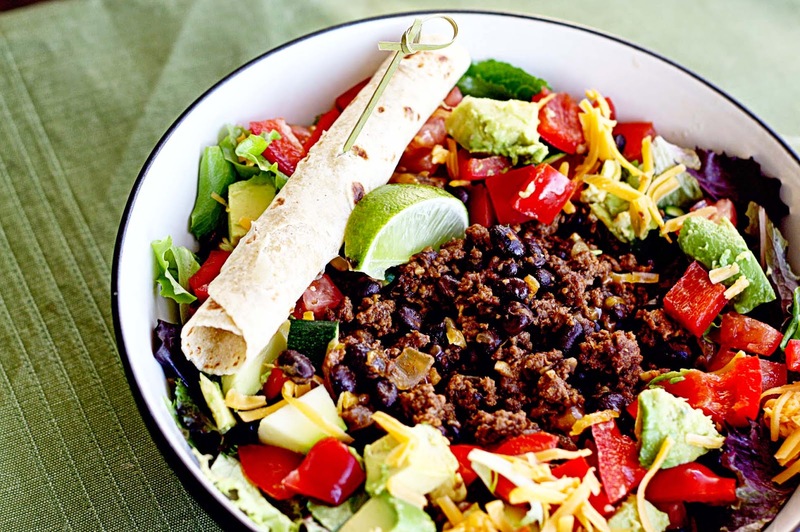 One of my favourite go-to meals on a busy day is a dinner-size taco salad. Over the years I've changed how I prepared the meat for this, but it's finally settled down to a simple process. To save prep time, while the meat mixture slowly simmers I prepare the salad base. I don't stick with traditional - I add all the veggies and crunch I can. It's my way of making it healthier. Then I top the salads with the hot meat mixture followed by a good sprinkling of grated cheese and sliced black olives. It's ready to be served. For a party you could make it build-your-own and just put all the ingredients out for guests to pick from, but be prepared that the meat and cheese will go first. This is a simple recipe - so keeping this post simple as well. Make - eat - repeat as often as you like. After you've done it a few times, you can get it from start to table in 30 minutes or less. Salad dressings such as - Ranch, Jalapeno Ranch, Cheddar Chipotle, Caesar, etc. Saute the beef over medium high heat, crumbling into small pieces as it cooks. When all pink is gone, drain off any fat in a colander. I always rinse the meat before returning to the pan as well to remove as much fat as possible. Add HALF of the jar of salsa, the can of drained black beans, chili powder, salt, pepper and a small amount of water to help everything mix easily (I would guess about 1/3 or 1/2 cup). Simmer over low heat until most of liquid has evaporated. Be sure to stir and check frequently so the meat mixture does not burn. 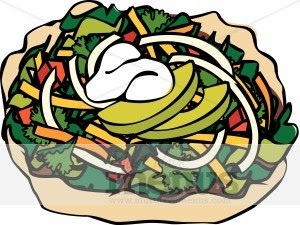 Split the salad mix between 4 dinner plates and top with vegetables. I put the pepper, carrot and snap peas on first (optional ingredients would go here), then the avocado and lastly the tomato. When meat mixture is ready, mound a large serving on each salad. Top with cheese and black olives. Stock image - but just love the presentation on this one. Serve immediately along with salsa, sour cream or yogurt and a selection of dressings. If you want bread with this I would suggest warm tortillas. Be sure and check back as I will try and share how to serve chicken burritos in 10 minutes or less.